This entry was posted on July 22, 2015 at 2:44 pm and is filed under Bad Statistics, The Universe and Stuff with tags dark matter, galaxy clusters, Katie Mack, neutrino, Particle Physics, Sterile neutrino, XMM/Newton. You can follow any responses to this entry through the RSS 2.0 feed. You can leave a response, or trackback from your own site. Incidentally, the author seems to have used the phrase “astrophysical sigmas” before: http://resonaances.blogspot.com/2014/03/signal-of-wimp-dark-matter.html . We should know one way or another next year thanks to Astro-H, which launches early 2016. 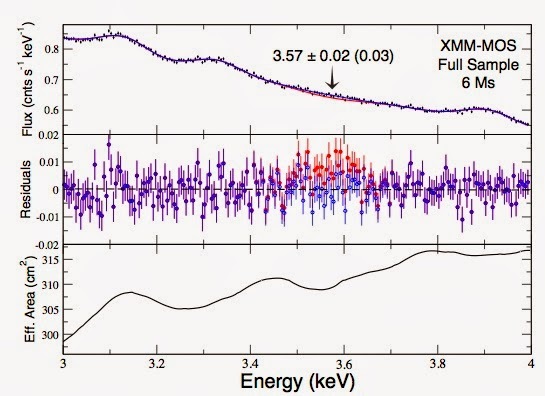 The X-ray microcalorimeter instrument will measure the feature with a resolution sufficiently good to determine whether the line width is consistent with emission from a collisional plasma or from dark matter annihilation. …only to find that, after counting and integrating for eight hours, the ‘peak’ disappears into the background. I once went to an entire meeting on X-ray cosmology. I’ve been deeply sceptical about the entire field ever since.. The astrophysical sigma could be the physical sigma multiplied by a normalized newsworthiness. I am specifically not mentioning Bicep. More likely, though, is that it is an estimate-by-eye of the physical sigma. Experienced spectroscopists do have an uncanny ability to pick out the funny bits in their data. It combines X-ray spectral analysis tools with the MultiNest algorithm.